Before installing any roofing materials at the eave, make sure the area is framed/trimmed correctly. 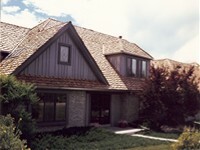 See Eave Framing/Trim Problems web page for more information. 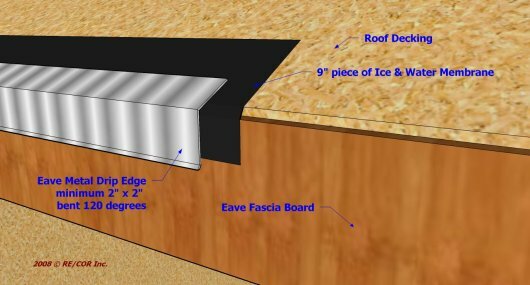 For most, if not all, sloped roofing materials, the accessories installed at the eaves are the same - a Eave Metal Drip Edge and an Ice & Water Membrane. 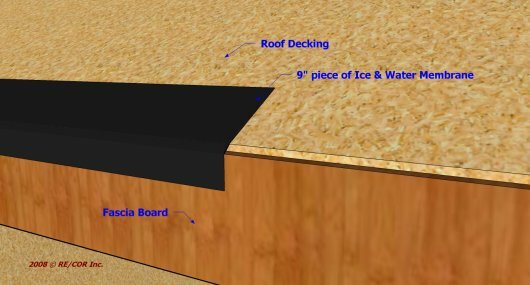 First, a 9" or so strip of an Ice and Water membrane is installed 1" or 2" over the fascia board and the rest up the roof slope directly onto the decking. This is not installed over the back of the gutter. Second, a Eave Metal Drip Edge is installed a minimum of 2" over the fascia and up the roof a minimum of 2". This may vary. If there is a small gap of no more than an inch between the roof decking and the fascia, or the back of the gutter on the down sloped end cannot be over lapped by a minimum of 1", the size of the Eave Metal Drip Edge will need to be increased. Maximum nailing pattern is 12" on center through the decking of the roof. This Eave Metal Drip Edge is usually bent at 120 degrees if 6:12 roof pitch, increasing the degree of the bend if the roof pitch is steeper. If placed behind the gutter fasteners, they will hold it tightly to the back of the gutter. Very little, if any water or ice, will be able to crawl up and behind the gutter even from ice damming when the gutter hangers are placed no more than 2' apart. Third, is the installation of an Ice & Water Membrane over the Eave Metal Drip Edge and up the roof slope a minimum of 2' past the exterior wall. This is where most of the damage from ice damming occurs. It is not from the ice dam itself. The damage is caused from the watery slush that occurs just behind the ice dam before it too freezes. 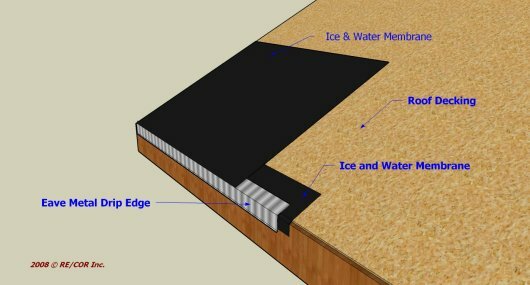 This Ice & Water Membrane prevents this watery slush from seeping through the sloped roofing material, nail heads and any openings it may find into the decking, soffits, walls, etc. Make sure this Ice & Water Membrane is fully sealed to the metal drip edge which sometimes requires using a roller.